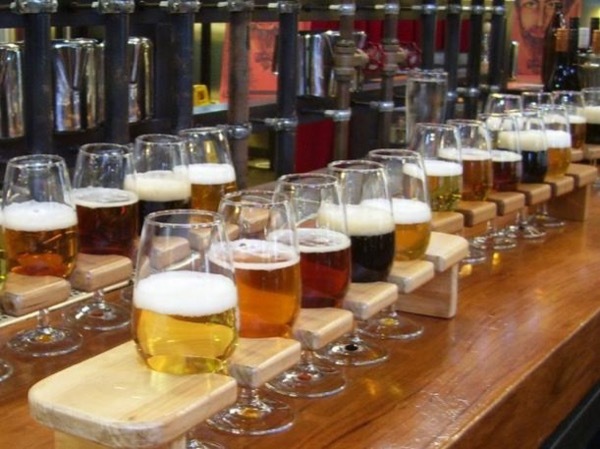 Sample boutique Auckland craft beers - with lunch included! Phil did a wonderful job of showing us the island while we visited several wineries for tastings and had an incredible lunch at a fabulous restaurant! Very pleasant day! An excellent day. Phil organised everything beautifully to fit in with my limited mobility. We combined some great views and sightseeing with aspects of the foodie tour. Nothing was too much trouble. We would highly recommend Phil to anyone visiting the area. PS the food was excellent! Phil was an outstanding guide. The places we visited we would never have found on our own. Everything was delicious and gave us a wonderful introduction to Auckland and New Zealand. An excellent tour with an excellent guide! We highly recommend him. Phil was great and we enjoyed the day with him. We had a great day of wine tasting and site seeing on Waiheke Island with Phil. Phil's knowledge of the local wineries really made our tour special. We also had a great lunch at the Mudbrick Restaurant and Vineyard--some of the best food that we have had in NZ. Phil was excellent. Very knowledgeable about the wineries and the wines. We had a wonderful tour with Phil. He is very knowledgeable about wine and had good personal insights. Phil also had good personal relationships with the wineries that we visited. He arranged a wonderful lunch and was very responsive adapting to things that we wanted to see. We had a great day with Phil visiting 4 wineries, having a great lunch, and experiencing some of Auckland's beautiful sites. Phil's knowledge of the local wineries and the history behind them made this a really fun day for my wife and I. We highly recommend Phil. Phil was a great tour guide. It was a very relaxed and enjoyable day. He catered to what we wanted to do / try, and also made sure our kids (ages 10 & 13) had a good time. He even left us each with fantastic goodie bags to take some of the NZ tastes home with us. Phil was a great tour guide. He had a very well organized and informative tour yet he took us to some out the way places that he likes to go which is exactly what we like. He does a good job and we would highly recommend him. Great personalized tour of Waiheke Island wineries. Phil was a delightful and knowledgeable guide. Took care of all the details from ferry tickets to private winery tours for the four of us. Lunch arrangements at Mudbrick Winery was a highlight of the tour. Would definitely recommend his tour. It was a great beginning of our trip to New Zealand. Phil met us on time. We all wanted to stop during the tour for a beer and he accommodated us. We toured a couple of wineries and had a very nice lunch at the second one. He was knowledgeable and friendly. There were 5 of us and all had a wonderful time! One more fantastic tour with Phil once we already enjoyed having him as our guide for the VIP winery and west coast tour (highly recommended). Waiheke is really a paradise, and the nice wineries are a treat! Phil is open to any questions you may have about wine. Our favourite of this tour was the Peacock Sky winery spoiling us with not only fabulous wines but also fantastic food samples as a perfect match to the wines to be tasted! Great fun! We had a very nice tour with Phil. He drove us to three very nice wineries plus the marvellous Muriwai black sand beach. He is a funny guy and very knowledgeable about wine and the history of wine growing in New Zealand. Don't forget to check his book "New Zealand Wine Guide: A visitor's guide", available on Kindle! Highly recommended! Cheese, ice cream, honey, wine, chocolate and a pottery demonstration. What could be better?! What a wonderful day with a chance to see gorgeous scenery outside of Auckland. Had a great day with Phil. Very enjoyable. Cheers to Phil! Loved Waiheke and Phil's tour. He knows wine and the Island. Based on his tour we are ready to move there. Thank you for making our first time experience first rate! Phil is very nice and very laid back. I like his touring style and he took to many wonderful places. I'm not a big wine drinker but surprisingly, my favorite part of the entire tour was the winery he took me to. It was stunning and beautiful and reminded me of being in Italy. I really enjoyed his van as well. It is so spacious and comfortable. We also had lunch at a great restaurant and the salad was so delicious. We also went to visit some food markets and I'm so happy we did (I love kiwi fruit). Phil provided a very comprehensive look into the food and wine scene of Auckland (and vicinity). He was friendly and knowledgeable and took us to an amazing range of places. If you want to get away from the city and enjoy a day with the people of New Zealand, then this is the tour for you. Phil is friendly and engaging and everyone enjoyed their day with him! Amazing day with Phil, his knowledge about wine and the country of New Zealand made this a most enjoyable day for us. He was warm, extremely hospitable and became a friend in a short amount of time! The wineries he chose for us were outstanding and we felt as if we truly had the "insider's tour" through this gorgeous country. We were in an SUV so had great vantage points for photos and he offered to stop whenever we wanted to take a shot. Our lunch at Mudbrick was delicious. We highly recommend Phil! Very informative and I really got to know Auckland. Phil had to be really resourceful for lunch due to the public holiday. He found a great and historic location. Half a day in Auckland.......what can you possibly see or do. Well, Phil gave us a tour to remember. Our Flight landed at 11:30, dropped our bags at an airport hotel, Phil was waiting and off we went. Phil, modified a gourmet wine tour to include a beer tasting , all of the sights one could possibly see in an afternoon and topped it off with a great dinner at a local seafood restaurant. He drove us back to our airport hotel and we were off the next morning Great tour , the 4 of us loved it. Phil showed us a lovely part of New Zealand, and we had a very enjoyable day with him. We enjoyed the two wineries and the delicious lunch, and of course the stop for chocolate was greatly appreciated! In addition, we learned about Manuka honey and the process of making pottery from the local clay. Phil was both professional and personable, and we were very satisfied with our tour. This was the best tour of entire trip to New Zealand!! We had a wonderful and fun day exploring Auckland with Phil and his lovely wife Mia. They made us feel welcome and their enthusiasm for "their city" was evident and contagious. Phil was professional, friendly and a great driver/tour guide. Would highly recommend him to anyone visiting Auckland. We had a thorough and exciting tour of Auckland that makes us want to visit this great city again some day. We did 8 tours in NZ and Australia and this one was deplorable. Phil did not know how to get to Waitomo, had to read google maps, got lost on the return, and did not offer any conversation or input to our trip. He was not knowable. I would never recommend him to any tour. We are so disappointed with his attitude, I am requesting a refund. TOUR GUIDE RESPONSE: Howard booked a tour with me as a ‘one-off’ Waitomo tour, knowing that I did not take tours to Waitomo. As a backup for navigation I used a Navman GPS. I gave an informative commentary via the on-board sound system, but unfortunately the clients ignored me and talked constantly (and loudly) over my commentary. On exiting the caves, Howard said, "That was nothing. The one we saw in China was much better." I was friendly, informative and helpful thoughout. Accordingly I was stunned by Howard's complaint. TOURSBYLOCALS RESPONSE: Guide and his support manager were made aware of the situation and are working together to avoid impressions like Mr Parker's in the future. The customer was compensated accordingly.